China Chilcano is a venture of José Andrés in DC’s Penn Quarter. 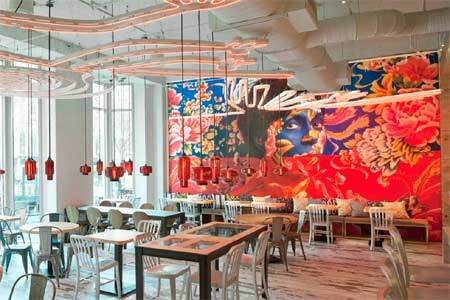 : Right in Penn Quarter’s restaurant-dense stretch, José Andrés’ China Chilcano offers a menu that pairs indigenous Peruvian, Chinese and Japanese fare enjoyed in Peru by these three local cultural communities. Studying the menu clarifies how the diverse tastes have melded. Your best bet is to mix it up, starting with several Peruvian and Chinese appetizers such as the shrimp dumplings and the lamb pot stickers. Add to those the traditional Peruvian potato dish, papas a la huancaina, presented here with baby potatoes topped with a scoop of sauce and a sprinkling of baby flowers. Main dishes can include the typical Peruvian seafood soup, the chupe; a selection of sashimi or sushi; or Chinese dim sum like noodles with ground pork seasoned with a complicated dark sauce. There’s also the customary Peruvian lunch, an overstuffed sandwich --- we recommend the crispy pork belly. Of course, a true Peruvian meal should include a selection of ceviches. Dessert choices are limited but the top draw is the Suspiro Limeña, which is essentially dulce de leche with passion fruit and wands of crunchy meringue. Exotic cocktails and a short but inspired wine list will add to the meal’s enjoyment. By the way, the flashy, colorful décor impresses.